Avanti Group Solutions, which is owned by Chief Executive Glen Smith (pictured), announced today that Healthcare Partners (‘HCPL’) is to re-brand as Avanti Healthcare effective 1 January 2015. Avanti Healthcare specialises in private medical and health insurance and was founded in 1996. Glen later founded sister company Avanti Insurance Ltd. in 2011. It was always the intention of the Essex-based Entrepreneur to leverage the synergy of his successful health insurance business and the award-winning travel Insurance business, Avanti Travel Insurance. With effect from 1st January, both thriving businesses will work side by side as specialist departments of holding company Avanti Group Solutions. 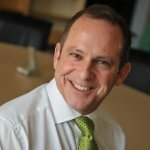 With a matrix management structure, Glen sits at the helm aided by Non-Executive Chairman Des Benjamin, who joined the Avanti Group in July 2014 and is the President of the Institute of Customer Service and the former Chief Executive of Simplyhealth. Avanti Healthcare is the largest independent healthcare specialist in the East of England, with access to the entire market of insurers offering PMI, iPMI, Cash Plans, Income Protection, Dental Plans, Death-in-service and Critical illness Cover. With ownership and management remaining the same post re-brand, the two departments benefit from dedicated specialist staff, which, in turn, contribute to the overall success of the company. Since launch, Avanti Travel Insurance has issued almost half a million policies and Avanti Healthcare has served almost 1000 companies as well as 2000 private individuals. Avanti was established in 1996. In the past 5 years Avanti has shown spectacular growth, and anticipates premium in excess of £23 million for the current financial year. We expect to issue our 500,000th policy by the end of 2014, with Avanti fast on its way to being the UK’s leading provider of Travel Insurance for the Over 50s and the largest healthcare specialist in the east of England. For all media enquiries telephone 01376 556910.